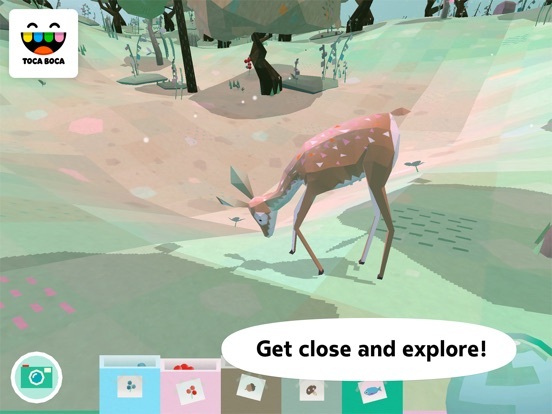 Bring the outdoors in as you explore nature and the animals hiding beneath the trees in this adorable nature-centered app. Most kids don’t have a forest or mountains in their backyard. Even if they do, it can be difficult to get out every day and learn about the plants and animals contained within. 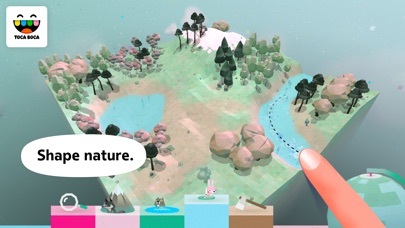 Toca Nature gives kids the chance to experience the mountains, lakes, and forests on a different level. 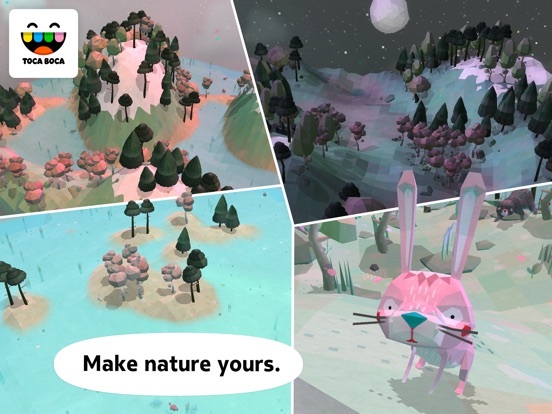 Kids don’t just get to walk through the forest, they get to build it, placing trees, mountains, and lakes in their virtual world, and then zooming in to experience the creatures that live within. 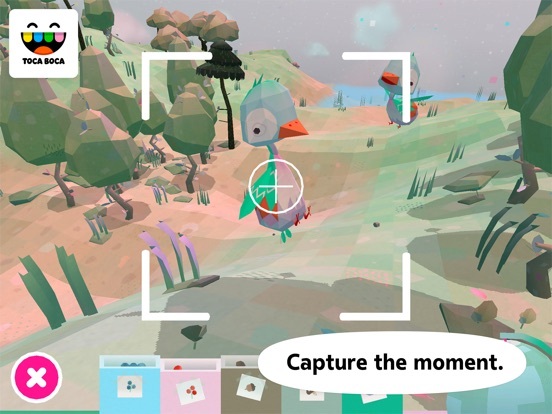 With this app, kids will get to experience nature in ways that they can’t in real life. 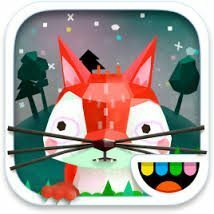 Toca Boca apps are known for their quality, but Toca Nature stands out thanks to its beauty and attention to detail. 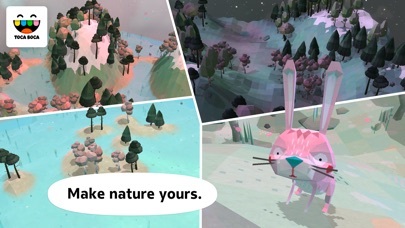 From the woodpecker tapping away at the word “Nature” in the opening screen to the wind blowing as part of the opening music, the app really captures the experience of walking in the woods. 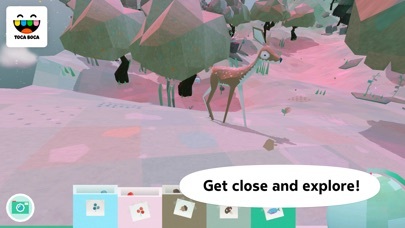 This quality isn’t as evident when kids are first adding trees and other elements to their world, but it shows up again as kids zoom in. There they will find adorable animals and more unique details. They’ll even get to hear the crickets chirping and owls hooting at night. 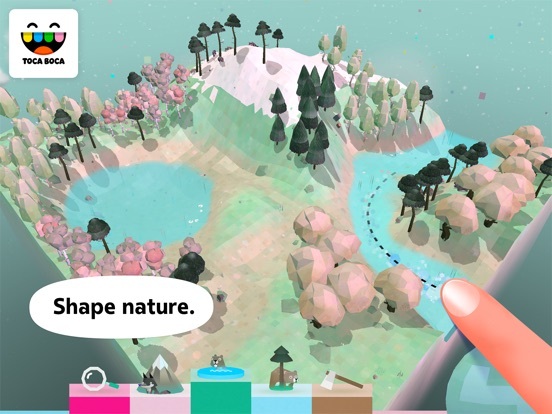 The app teaches kids about nature in subtle ways. They won’t be bored with lectures about the forest or how everything works together. Instead, they’ll get to learn through experience and discover elements of nature for themselves. Kids will plant forests and create other natural features to help animals appear and learn which animals come out more at night than during the day. 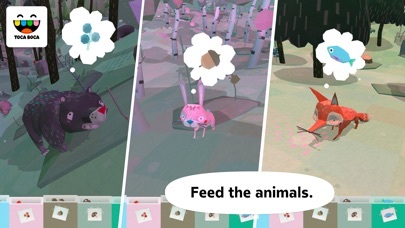 They’ll collect food and discover which foods different animal species like to eat. They’ll also learn that growth and development takes time. This isn’t an instant gratification app. Kids must wait for animals to appear, flowers to grow, and the sun to rise and set, which helps them learn about nature in the process. Even though Toca Nature doesn’t always offer instant gratification, it offers enough to keep kids busy as they play. For example, while kids look for animals in the forest, they can walk around and collect nuts, berries, and mushrooms to feed to animals. They can also regularly build up and tear down the trees, lakes, and mountains they add to their world. 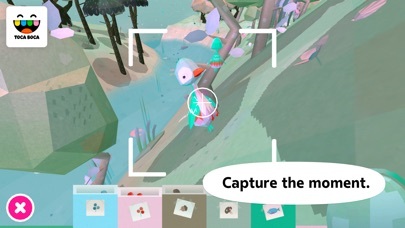 A camera feature also allows kids to take pictures, so they can capture some of the special sights and cute creatures they find as they explore. 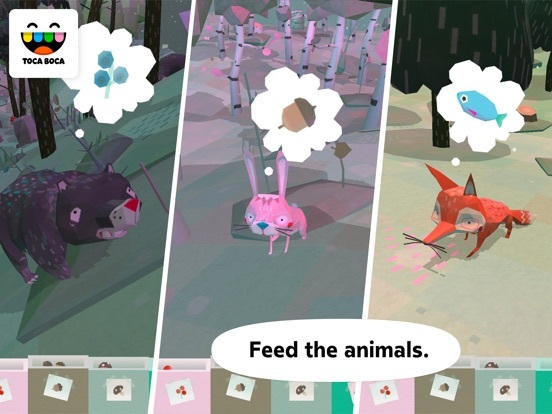 Priced similarly to other Toca apps, parents will find that Toca Nature is worth every penny. At first, kids may not jump right to the app, but if they give it a little bit of time and are willing to explore a little more they will find that it becomes very entertaining. An icon for the parent section appears on the app’s main screen and has parents enter their date of birth to gain access. Most kids won’t even notice the icon in the top corner because they’ll be too busy tapping the play button and entering their own world where they can control the scenery and the animals within. The app does require patience, which may frustrate some kids, but the more they play and let their world develop, the more they’ll enjoy it. Kids are in charge of the hair salon in Toca Hair Salon 3. What crazy hairstyles will they create? Go on a parade with Brown Bear and his animal friends in Eric Carle’s Brown Bear Animal Parade.